Ambient/Algorithmic work under "French Alexander"
Hello! I graduated from Towson University with a degree in Music Performance, having studied classical guitar, piano, free improvisation, and electronic composition. I have observed many classrooms catering to general music and guitar. I currently compose under the name French Alexander. Current projects include composing background music for The Anime Book Club and The Scavengers Network as well as a chiptune inspired album. I believe students should be taught to their needs, not to any particular method. While there are some essentials that every student should have, each student has their own path and it is up to the teacher to guide and encourage them. I work with every student to determine what would be most beneficial, and structure lessons around material that resonates with and challenges them. 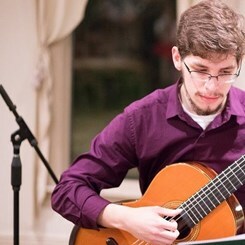 Request Lessons with Alexander Taylor today!